Georgina Callander is the first person killed in the Manchester, England concert attack to be publicly identified. The teenage student is a big fan of singer Ariana Grande, who was performing at the Manchester Arena Monday night. It's still unclear how many are missing. There are reports the youngest victim is just eight years old, reports CBS News correspondent Jonathan Vigliotti. The Manchester Royal Infirmary Hospital declared a "major incident" overnight. They stopped accepting patients with other emergencies. One of eight hospitals that accepted patients from the blast, it's reportedly the main one treating patients. There have been calls for blood donations, meaning the attack's impact has them asking for more resources. Some of the victims brought to the hospital were reportedly paralyzed by shrapnel. "She came on for an encore, she sort of blew a kiss to the audience and then walked off, and then the bang happened," concertgoer Kirstyn Pollard said. "Once we exited the door there was blood across the floor," another witness said. For the capacity crowd inside Manchester Arena, it was disorderly. "Everybody's pushing, everybody's shoving, there's shoes being lost, phones being dropped," Stephanie Hill said. "Girls were crying and we saw these women being treated by paramedics, they had open wounds on their legs, no shoes. It was just chaos," Sebastian Diaz said. Karen Ford was inside with her 13-year-old daughter when the bomb went off. She said her husband panicked when he could not find them in the aftermath. "For about 10 minutes, we were trying to look for each other," Ford said. "They thought we were dead." U.K. Home Secretary Amber Rudd said Manchester has been affected by terrorism before, but she noted how this strike seemed to target innocence. "This time it has been a particular attack on the most vulnerable in our society," Rudd said. After the terror, there was comfort on the streets of Manchester. Now, there's resolve. "These were children, young people and their families that those responsible chose to terrorize and kill. 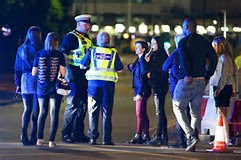 This was an evil act," Manchester Mayor Andy Burnham said.